Why do we only have cranberry sauce during Thanksgiving?! It is, in my opinion, one of the most delicious condiments you can have. As a sweet and tart sauce to roasted meats or spread on some homemade, fluffy buttermilk biscuits, cranberry sauce goes with everything. Perhaps that is why it’s on the Thanksgiving menu. I personally love cranberries. When cooked, they have so much natural pectin that the sauce comes out with great texture. My recipe is quite a far departure from the cranberry sauce in a can. It’s a mixture of tart, sweet, and spicy with the welcome additions of roasted jalapeños, bourbon, and orange zest. But even despite these bold flavors, this sauce is cranberry all the way through since I use fresh cranberries, dried cranberries, and cranberry juice. Make this recipe and people will be raving about your cranberry sauce year after year. I use fresh cranberries, but you could also use frozen as long as they are defrosted. This recipe will make more than enough for your Thanksgiving table, leaving you with enough to make sandwiches the next day! Get a saucepan over medium heat and add a little bit of oil to it. Add the onion, ginger, and jalapeños to the pot and season with salt. Cook until the onion is translucent and the ginger is aromatic. Do not let the onion brown. Add the bourbon to deglaze the pan. Let most of the alcohol burn off and let the bourbon reduce. Add the cranberries, sugar, honey, cranberry juice, orange zest, orange juice, and cinnamon stick. Stir everything to combine. Bring the sauce to a boil and let reduce to a simmer. Let the sauce cook for about an hour until it is nice and thick. If the sauce is too thick, add some more water. If it’s too thin, keep cooking it and allow the sauce to reduce more. Add the end, stir in the dried cranberries and season with salt and pepper. If the sauce is too spicy for you, add more honey. 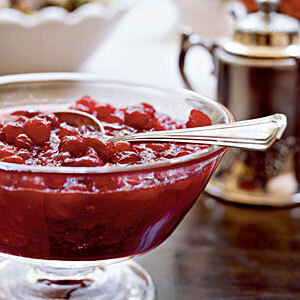 A great spin on the classic cranberry sauce recipe. Hope you try it out and enjoy it! That looks awesome! Could you use fresh cranberries? Thank you! You could, and I do, use fresh cranberries. I throw the dried cranberries in there for texture at the end. You could use all fresh if you want. I am a HUGE fan of sweet/spicy relishes! Love the idea of this combination – the tartness of the berries contrasting the sweetness of the bourbon and honey. The Jalapeno heat is a bonus, too. The orange zest will definitely add that citrus needed to brighten all of the flavors. This is very well written, and I am looking forward to making it.